Our very Full House: I love my hubby! First off today, I want to recognize my wonderful husband and wish him again Happy Father's Day! We celebrated by Colin and Cameron waking him up with gifts and cards. He got a Lowe's gift card and a homemade shirt from the boys. The front says "Our Daddy is PRICELESS" written around a picture of a sku (drawn by yours truly--Lynette, Karie and Aimee should appreciate that I am getting craftier as the days go by!) 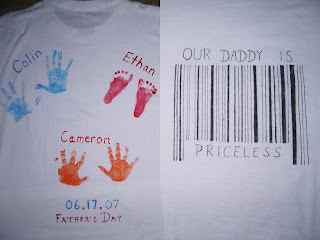 and the back has all of the boys handprints painted on it in different colors (Ethan's footprints) with their names and it says 06.17.07, Father's Day. He loved it and we all had a great day....we went to church, came home and had one of Shane's favorite meals, played with the boys and rested, then went back to church later that night. It really was a great, relaxing day for all of us! 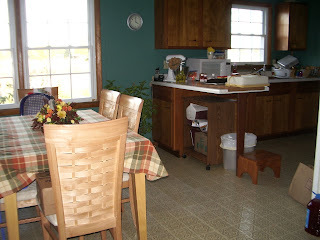 I also wanted to let all of you know the wonderful progress that Shane has made on our Kitchen/Dining Room remodel! If you saw the snake pictures, you know that Shane has been working on the kitchen/dining room project for a couple of weeks now, and he just recently got a HUGE hunk done while the boys and I were in Chicago. 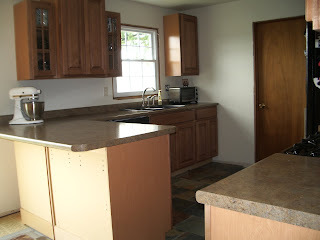 Here is a shot of the old kitchen, which no longer remains!! Here is a run down of what Shane did in about 10 days: all new wiring/electrical, all new plumbing, new lighting (recessed lights completely in, with a new ceiling fan with lights and two pendant lights over the island still to come! ), that hideous teal panelling torn down and new drywall installed, drywall finished (doesn't sound like much, but that one is a three day project in itself! ), walls and ceilings primed, cabinets installed, new appliances--including my most favorite appliance, the DISHWASHER!--finally in! !, new sink and faucet installed, garbage disposal installed, countertops installed, new slate flooring installed, and both windows torn out and a new sliding glass door put in! That door will someday step out onto a deck! It is so beautiful NOW, I just can't imagine when everything is completely done!! 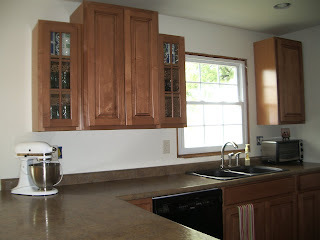 There are still small things to do, of course...paint and decorate :-), all the cabinet hardware and trim put up, built in bookshelves installed....but as of now, the kitchen is fully functional, and it is so efficient! I love it, and I can't thank Shane enough for how hard he worked getting it all done for me while we were gone! 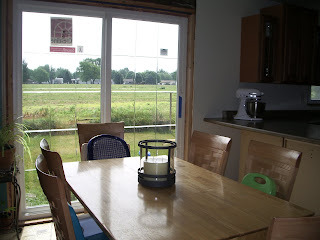 There is still much that Shane wants to do with this project....the dining room is actually going to be extended about 5 feet backwards, so that will make things lots more roomy! There will be stools put up at the bar area, and archways in all the entrances, which are so beautiful and one of Shane's signature touches. There is much more I could mention, but I will let you all be surprised to see everything once it is completed! The last picture here is a picture of my most FAVORITE cabinet in my kitchen, what I call my "fancy" cabinet. I love the seeded glass doors, and how it just adds that extra something to the kitchen as you walk in. I had to beg for that one, (not the most practical, money wise :-)) but I am so glad Shane agreed to it. I love it! Honey, I love you so much, and I appreciate all the hard work you did. You mean more to me everyday! 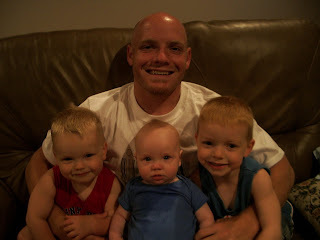 Thank you so much for being such a wonderful husband, and an amazing father to our boys. I LOVE YOU!! Oh my--love the shirt you made-where did you get that idea--very crafty I must say and the time you had to do all that was when???? haha. Doesn't it make you feel good though to get something so "priceless" done in your day like that-- :) I'm sure Shane loved it. Very meaningful! thanks for your comments on my blog--we take it day by day, don't we :) You do a great job blogging too I might add. Love your pictures!! I am so proud of Shane for all that work he did while you were here. Its amazing.... What a guy! It looks awesome. Are you guys going to plan on staying there in that house then or sell it like you normally do? Hey, have fun at the reunion this weekend. Amanda told me they are going--I'm sure it'll be nice to see everyone again! I just found your blog! I didn't know about baby number 3- CONGRATS! Your boys are beautiful! And your new kitchen is really nice!